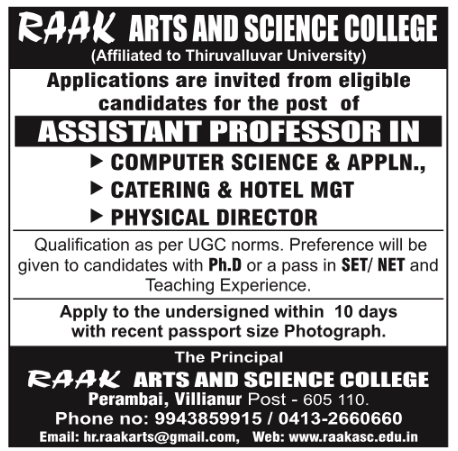 Raak Arts and Science College, Puducherry has advertised in the DINAMALAR newspaper for recruitment of Assistant Professor Plus Physical Director jobs vacancies. Interested and eligible job aspirants are requested to apply within 10 days from 12th February 2019. Check out further more details below. About College: RAAK Arts and Science College, is a unit of Farouk Educational Trust which was founded by Mr. B. Mohamed Farouk. Mr. Farouk is the Chairman of Farouk Bros & Co. in Bangkok and Hong Kong. The Trustee is already running other institutions such as RAAK Nursing and Paramedical College, RAAK Institute of Hotel Management and Catering Technology, RAAK International High School and RAAK College of Engineering and Technology. How to Apply: Interested and eligible candidates are requested to send application along with their CV, copies of certificates and recent PP size photo to the email address / postal address provided below.